Our seminar ‘Middle Eastern Christians in Europe: Background, significance and policy implications’ had been planned for a long time as we wanted to reach out to stakeholders and ecumenical representatives based in Brussels. Encouraged by the ever helpful Doris Peschke from CCME, Dr Fiona McCallum and myself met early in the morning in our hotel to polish a handout which was to be given to the event participants. Interestingly, the same piece of advice – to prepare a short and clear handout for policy makers – had been given by Neil Crompton, Director, Middle East and North Africa at the Foreign & Commonwealth Office, UK, during a plenary session we attended at the annual conference of the British Society for Middle Eastern Studies (BRISMES) in London the week before our Brussels trip. Following this approach, we tried to make our presentations as concise and intelligible as possible – not always an easy task for academics! We took the short walk from our hotel to the CCME office – a pretty red brick townhouse. Our Danish partners – Dr Lise Paulsen Galal and Dr Sara Lei Sparre had already arrived having left Copenhagen early in the morning in order to fit in the event as a day trip from Denmark. I was pleased to meet Doris Peschke and Torsten Moritz again, both of whom represented CCME at the meeting and have attended various DIMECCE events over the project period. I was also happy to recognize Gunilla Moshi, a deacon from the Church of Sweden, who I interviewed as part of my fieldwork in Sweden – she had come from Stockholm just for our event. Then I noticed a neat pile of our DIMECCE booklets ‘Middle Eastern Christians in Europe: Histories, Cultures and Communities’ – fresh from print! Each of us grabbed a booklet and posed cheerfully – happy to present the fruit of our shared effort. Hearing Arabic language, I approached a grey-haired man in a blue shirt. He turned out to be Yonadam Kanna, an Assyrian politician, member of the Iraqi National Assembly as well as a founder and Secretary General of the Assyrian Democratic Movement (Zowaa). After chatting for a while, he gave me a leather pennant of Zowaa and an invitation to Baghdad! He was accompanied by a journalist Essa Santa, an Assyrian based in Brussels, who has just returned from Iraq reporting on the status of Christians there. I asked her about the Assyrian community in Belgium and she was eager to give me information on its size and churches. Joined by Fr. Nektarios Ioannou from the Church of Cyprus, we enjoyed a light lunch organised by our hosts CCME. By the end of the lunch, the seminar room had filled up with guests representing various churches and institutions. The programme commenced with Doris Peschke delivering some welcoming remarks and then I presented a short project overview publicising our booklet and speaking about planned publications. Lise and Sara talked about Middle Eastern Christians being transnational actors and Fiona discussed the different interactions Middle Eastern Christians have within UK, Denmark and Sweden. Together the three presentations took under an hour but were full of facts, quotes and analysis, which were appreciated by the listeners who congratulated us on a well-structured discourse later on. After a very short break, Doris invited guests to ask questions. Rob van van Drimmelen, retired General Secretary of APRODEV (the Association of World Council of Churches related Development Organisations in Europe) inquired about support given to Middle Eastern Christians at the local level and about converts into Middle Eastern Christianity in Europe. He was given several examples of assistance in the three countries and informed that conversions occur although they are not numerous. Doris remarked that it is far more common for Middle Eastern Christians in Europe to attend churches of other denominations (especially when there is no church of their rite in the neighbourhood) than change denominational belonging. Yonadam Kanna then asked for a possibility to speak. After thanking team members for raising awareness about Middle Eastern Christians in Europe, he spoke about the difficult Assyrian past and present including Seyfo, Simele, and the current situation in Iraq particularly the expansion of ISIS. He mentioned that Iraqi Christians are helping non-Christians – especially minorities such as Yazidis and Shabaks – sharing with them humanitarian relief, i.e. much needed clothes. Kanna stressed the importance of maintaining European values at a time when he perceived them to be under threat. He argued that Western countries often fuel conflicts in the Middle East and urged EU representatives to strengthen protection of Middle Eastern Christians in the region. The last intervention came from Rev. Joseph Bosco Bangura from Word Communication Ministries, Brussels, who wanted to know how the extent of access to church premises influences the spiritual life of faith-based communities; in particular the DIMECCE case study ones. Fiona, whose presentation at the DIMECCE conference in St Andrews in May 2015 covered this topic, was happy to give a comprehensive answer on the situation in the UK and I followed with some remarks on Sweden. There was some time for mingling and networking after the event. It felt strange saying goodbye to Lise and Sara – it was our last meeting before the project’s end in autumn – when we meet again, the DIMECCE project will be over – officially at least (hard to believe!). However, our job in Brussels wasn’t over yet. Led by Torsten, Fiona and I walked to the European Parliament building for an informal meeting with Catherine Stihler, a MEP for Scotland and the Rector of the University of St Andrews. Catherine’s assistant, Vanessa Ivanov, met us in front of the main entrance protected by stalwart guards and made sure that we were given visitors’ badge stickers – of course we had to give our personal information in advance – it is not so easy to enter the European Parliament! Catherine Stihler, who has been a Member of the European Parliament for Scotland since 1999, was a warm, easy-going person as well as an experienced politician with broad knowledge of international relations – after all she had studied in the School of International Relations at St Andrews! She was interested in the project findings and took one of our booklets. We discussed several issues with her including the history of UK-Assyrian relations, the present situation in Syria and different options of assisting Middle Eastern Christians in their homelands. When the one hour meeting came to an end, Catherine asked Vanessa to show us around the parliament building as she had to attend another meeting. 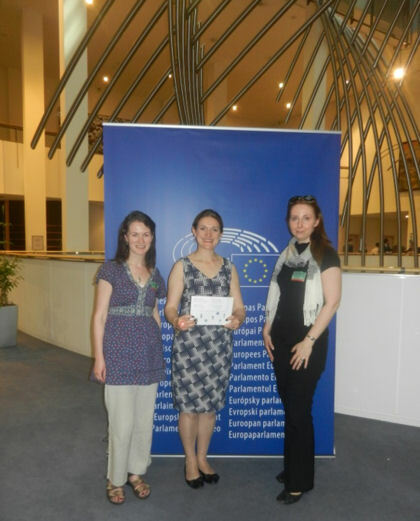 Vanessa was a wonderful guide – we really enjoyed our tour inside the enormous European Parliament building. With its half floors accessible only for authorised officials, it reminded me of Hogwarts from the Harry Potter tales. The building was not boring at all – apart from vast auditorium rooms crowded with MEPs, there were art exhibitions and sculptures sent by member states. 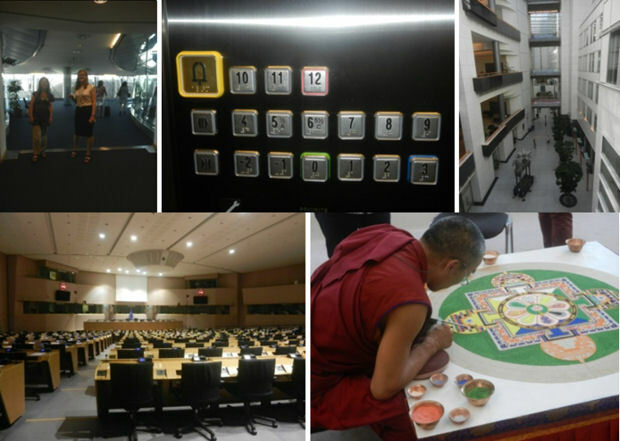 We even watched a Buddhist monk sandpainting a beautiful Mandala on a table in the main corridor – apparently he was part of a bigger delegation from Tibet. After our tour came to an end, we thanked Vanessa, handed in our visitor badges and left the building. Returning to the hotel, we caught a quick glimpse of the European Commission windows reflecting the setting sun. We finished this long, fruitful and impressionable day with a typical Belgian dinner with Torsten in one of the many small Brussels streets, observing signboards and passers-by, thinking how multicultural the city is and reflecting on another successful DIMECCE event! The panel also included Heidi Armbruster, an anthropologist at the University of Southampton and long-time researcher of Syriac communities, thus the DIMECCE-organised panel turned out to be a very strong and homogenous package of five presentations – three DIMECCE papers on their case studies (Fiona McCallum on the UK, Marta Wozniak on Sweden, Lise Paulsen Galal & Sara Lei Sparre on Denmark) and the two external contributions. It was a milestone for me during my first months as an intern, not just because it was an honour to be invited and have the possibility to meet the other scholars working on the UK and Swedish case studies and to attend the project workshop and meetings there, but also because I was invited to take part in both writing and presenting the Danish team paper. This was quite an exciting challenge for me and occupied my mind quite a lot during my first two months of the internship. In Ankara universities and institutions from 74 countries were represented and more than 1500 participants attended. The conference takes place every fourth year with the previous conference being held in Barcelona in 2010. At that event, Fiona, Marta and I met for the first time when we participated in two panels on Christians in the Middle East organized by CME (Christians in the Middle East research network). 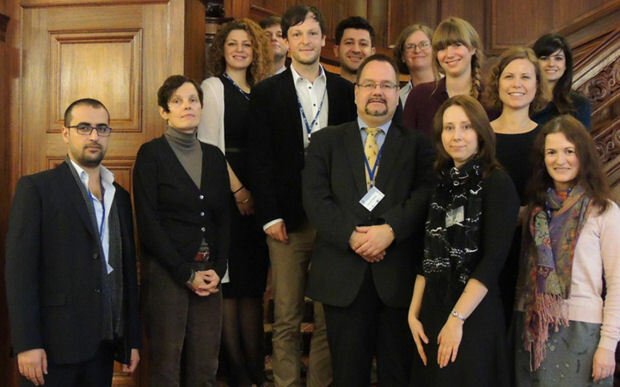 Thus WOCMES 2010 became the first chapter of the DIMECCE project, while WOCMES 2014 became one of several chapters presenting the project and some of its findings. In Ankara, CME had organized four panels on Christians in the Middle East; one of them constituted by the DIMECCE team presenting three papers on each case country (UK, Sweden and Denmark). DIMECCE team members. Left photo from the left: Dr. Marta Wozniak, Dr. Lise Paulsen Galal, Dr. Sara Lei Sparre and Dr. Fiona McCallum (photo by Marta Wozniak). Right photo from the left: Fiona, Sara and Marta (photo by Lise Galal). The conference took place at EDTÜ, or METU (Middle East Technical University). The university was founded in 1956 and is placed a little bit outside the city center and can be approached by a recently opened metro. The campus area is green and spacious with all kinds of facilities. While the distances between the three venue buildings left us hiking between panels, it also gave us the opportunity to enjoy the sunny and warm weather. It was my first visit to Ankara and the city was a pleasant surprise to me. People were very friendly despite – or maybe because – of a general lack of tourists, and the city offered a well-functioning infrastructure and what seemed to be a high standard of living. 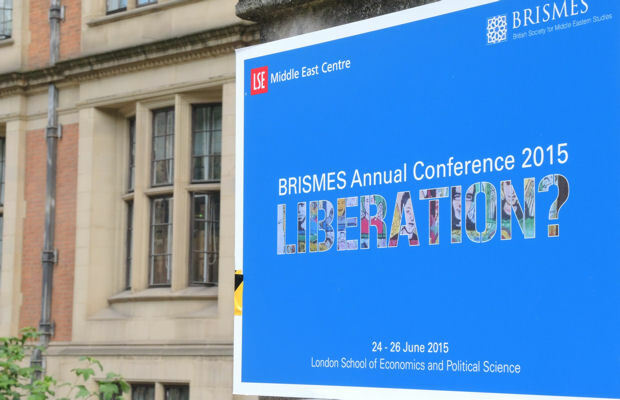 The five-day conference programme was huge and diverse. Not surprisingly many presentations were on Turkey, and a number of papers discussed the current political situation and conflicts in the Middle East. More surprisingly several papers had a focus on Shia’ rituals. Besides the four panels on Middle Eastern Christians, some of the most interesting panels in relation to the DIMECCE project which I attended presented different perspectives on Middle Eastern immigrants in Europe and the United States. Two sessions on conversion to Islam included several interesting country comparisons and discussions on religion and identity. Thus, one paper by Egdunas Racius explored converts in Lithuania, and another very interesting paper by Juliette Galonnier compared processes of racialization of converts in United States and France. The organizer Karin Van Nieuwkerk suggested conceptualizing conversion as moving, arguing that conversion is seldom the break or disruption that the term conversion connotes. Instead, we should rather look at how people move in and out of religion instead of religion as something that moves in and out of people. The four panels on Middle Eastern Christians were organized according to different perspectives. The first panel included three papers on historical perspectives on Christians and not least Christian mission in Syria and Palestine. The discussion of Catholic language politics vis-à-vis the Melkite community (1920-1950) by Karene Sanchez made me reflect on the importance of language politics in the target groups of the DIMECCE project. Different language politics converge, as the language of the community, the language of God, the language of the majority community, and the language of the local context. The DIMECCE panel was the second one in the series with a focus on Middle Eastern Christians in the three case countries and their relation to their country of origin (read more about the three presentations under ‘Outcomes’). The presentations were followed by time for questions and discussion and the team received useful comments and questions about identification with being Arab, gender specific narratives of Islamophobia, the influence of country specific asylum politics and much more! The third panel examined changing identities among Palestinian Christians and Christians in Bethlehem respectively. Mark Calder’s focus on the meaning of place referring to Manger Square was interesting as it raised the question of how different religious and competing groups navigate their local environment by using place(s) in specific ways. This seems very relevant to the DIMECCE project, where Middle Eastern Christians in the case study countries use different ways to try to create their own places where they can practice or articulate their specific Christian identity. The fourth and last panel on Middle Eastern Christians had two papers. One focused on Christians in Iran, another on Copts in Egypt after the 2011-revolution. Marcin Rzepka’s presentation on Christians in Iran demonstrated how Persian-speaking contrary to non-Persian-speaking Christians in Iran are unclassified minorities and as such they do not have any rights. The four panels complemented each other very well and gave wide and fruitful insights on the situation of Christians in the Middle East. DIMECCE team in action. 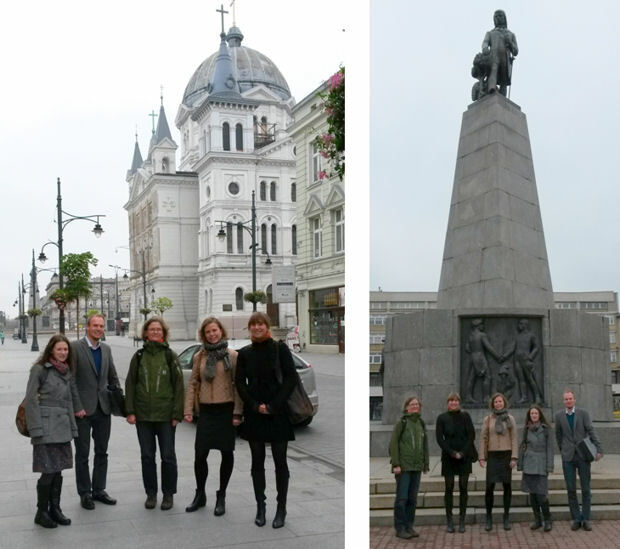 From left: Fiona, Lise, Marta and Sara (photos by Marta Wozniak). With most of the core team present in Ankara, we used the possibility to have a project meeting one evening which left us with still a few issues to discuss the following day after the conference finished. Two of the big issues were plans for publications and how to use the Nvivo software programme for analyzing interview material. Once again it made good sense to meet in person and elaborate on ideas and perspectives that we already dealt with via email. Since the conference took up most of our time with a very dense programme, sadly we didn’t really have time for sightseeing. However, the morning before the conference started, some of us managed to visit the citadel and some of the Roman remains. And, before going to the airport a few managed to visit Atatürk’s mausoleum which was impressive and perhaps more worthy of an emperor than the leader of a modern secular state! Overall, WOCMES was another successful outing for the DIMECCE team. The opening speeches by Hilde Liden, chairwoman of Nordic Migration Research, and Ulf Hedetoft, Director of SAXO Institute, introduced the theme of the conference – the status of both migration tendencies and migration research, especially in a Nordic context. The first plenary began with Thomas Hylland Eriksen, Oslo University, discussing the need to emphasise the ‘person’ when approaching the migrant issue. In a humorous way, he sketched out the differences between Nordic and Middle Eastern models of bringing up children to underline challenges faced by many second generation immigrants. The next presenter, and only female among the eight key-speakers, was Claudia Strauss, Pitzer College, USA. In her presentation on ‘Complexity in U.S. Nativist Discourses’, she argued that it is too simplistic to say that Americans are either for or against immigration as instead, people are exposed to a mix of conventional discourses, have multiple identities and therefore reproduce different discourses. In the second plenary, Nicolas de Genova, King’s College, London, explored ‘Border Struggles in the Migrant Metropolis’, i.e. spatial practices of migrants and their urban struggles. It reminded me of Jennifer Mack’s ‘urban design from below’ concept which I use to describe Assyrian/Syriac practices in Södertälje. The most controversial speech, however, was delivered by Philippe Legrain, London School of Economics, whose idea of ‘Border myths’ polarised the audience. Many praised the speaker for his bravery in advocating a total liquidation of state borders in order to ensure more justice and equal opportunities, but others found the talk demagogical and biased. It was certainly a vivid and thought-provoking lecture. As it was not possible to attend all 32 panels, the DIMECCE team split. I went to the ‘Childhood and Migration’ session which included two presentations about migrant minors in Sweden – my case study state. I found parallels between the information I have obtained from my interviews about the problems of Assyrian/Syriac children, especially boys, in Swedish schools and results presented in the session. Although Sweden has developed a sophisticated system of taking care of unaccompanied migrant children, it is argued that the children are often deprived of having one meaningful, deep and lasting relationship with an adult guardian. In addition, young migrant adults with little formal schooling tend to be sent to special institutions, which they find highly unsatisfactory. The last workshop on the opening day was one that was eagerly anticipated by the DIMECCE team as it was entitled ‘Rituals and migration’ and was organised by Marianne Holm Pedersen from the Danish Royal Library and Mikkel Rytter from Aarhus University. The aims of the workshop were reiterated: at the empirical level to explore how migration affects the performance of rituals and how the performance of rituals affects the process of migration, and at the analytical level to wonder if we can use ritual as a cultural prism to shed a different light on migration processes. 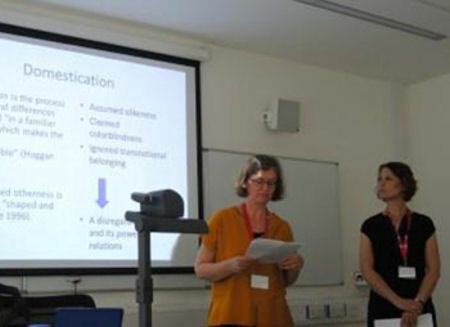 My DIMECCE colleagues, Dr Lise Paulsen Galal and Dr Sara Lei Sparre, presented their co-authored paper ‘Incense and Holy Bread: Middle Eastern Christians and their ritual encounter with the Evangelical Lutheran Church in Denmark’. Lise provided an overview of Middle Eastern spaces and persons in the Danish context, and included life-stories of Danish-Iraqi Christians. She stressed the importance of ‘doing things’ while performing the rituals and gave examples of adaptation to other visual and ritual norms. Sara then explored three ways of practicing rituals: 1) staying Christian and international; 2) surviving as a Middle Eastern Christian; 3) confirming a sense of being Egyptian. I found this classification extremely helpful and will check whether the first approach is found among Middle Eastern Christians in Sweden. In the evening, we attended a conference reception at Copenhagen’s impressive City Hall. A City Hall representative of German and Peruvian descent told me about the difficulties which migrants face in their attempts to integrate into Danish society, and her role as a member of one of the commissions set up to facilitate this process. Later on in the reception, I got to sample some Danish specialities – pancakes stuffed with sweet curd served on Royal Copenhagen Blue porcelain. They were delicious! Pancake reception – one of the benefits of being part of the DIMECCE project! A highlight of the second day was a panel on ‘Transnational Migrant Families: Norms, Laws, and Lived Realities’ where the paper on ‘Marriage Norms and Practices among Transnational Somali Families in Finland’ by Mulki Al-Sharmani and Abdirashid Ismail, University of Helsinki, was interesting given my own conference paper was on a similar topic. Another paper on ‘Pathways to old age; societal and familial embeddedness of old Turkish migrant women’ by Anika Liversage, SFI – The Danish National Centre for Social Research, discussed poverty among old Turkish migrants and made me wonder if it is the same in Sweden for elderly Assyrians/Syriacs from Turkey. Another panel entitled ‘Affectivity as a potential key to unlocking race and whiteness in the Nordic context’ was of interest as well – many of my interviewees speak about being perceived by Swedish society as being ‘non-white, black-headed, and consequently inferior’. The organised hospitality for this evening was an hour’s travel by public transport to a spacious wedding hall called ‘Laila’ which had typical Middle Eastern décor. It was interesting to hear from the organiser that this venue is used by different migrants – mainly from Arab and Turkish communities. 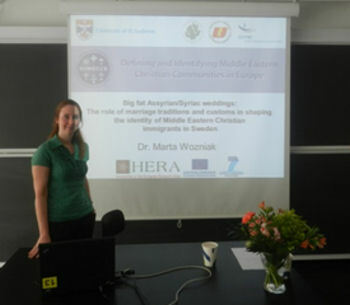 On Friday morning, I presented my paper ‘Big fat Assyrian/Syriac weddings: The role of marriage traditions and customs in shaping the identity of Middle Eastern Christian immigrants in Sweden’ as part of the workshop on ‘Rituals and migration’. I compared wedding rituals performed in an immigrant’s homeland with their new forms in the Swedish diaspora arguing that although Assyrians/Syriacs living in Sweden have already incorporated some Western traditions, their wedding rites are notably different from traditional Swedish ones; thus, these rituals are important in negotiating belonging in the migratory context – they serve both preservation and integration. The DIMECCE papers appeared to be well-received and are intended to be part of a journal special issue on migration and rituals to be organised by the panel co-ordinators. Attending the Nordic Migration Conference was not only successful on an academic level but also a good opportunity to meet old friends and make new ones. I left Copenhagen University pleased and satisfied. 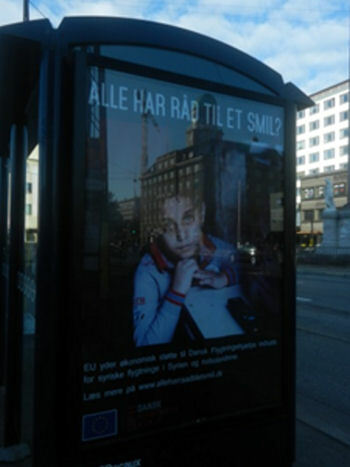 However, while waiting to catch a bus to the airport, I noticed a poster saying in Danish ‘Everyone can afford a smile’ with an image of a sad Syrian child refugee – his look haunted me long after, showing the link between our academic project and reality on the ground especially as two days later I was due to meet the DIMECCE team at the WOCMES conference in Ankara and speak about Syrian refugees in Sweden. 1. Jennifer Mack, 2014, “Urban Design from Below: Immigration and the Spatial Practice of Urbanism” Public Culture, 26(1-72), pp. 153-185. The objective of the conference was two-fold: to explore the discourses faith traditions provide surrounding migration and to examine the role that faith communities and faith-based organisations play concerning migration. Therefore, the title ‘Migration, Faith & Action: Shifting the Discourse’ was a provocative, perhaps ambitious attempt to challenge the economic-based focus which tends to be prevalent in policy-making circles and perhaps to a lesser extent within academia when discussing migration. The conference convenors were Oxford postgraduate students who won a prestigious competition to host a conference and were excellent in arranging an interesting programme and organising proceedings on the day. Their initiative was sponsored by Las Casas Institute at Blackfriars and The Oxford Research Centre in The Humanities (TORCH), University of Oxford. As one presenter was unable to attend, the ‘Faith and Migration’ panel I was part of became a de facto Middle Eastern migration panel. Dr Tahir Zaman, a Visiting Fellow at the Centre for Research on Migration, Refugees and Belonging at the University of East London, UK, in his paper entitled ‘Home, Sacred Home: Islamic Theologies of Migration in the Emplacement Strategies of Displaced Iraqis and Syrians’, provided an interesting discussion on how the concept of the umma (community of Muslims) has been employed by both Iraqi refugees in Syria and Syrian refugees on the Turkish-Syrian border as a coping strategy with their situation in contrast with the ‘guest’ term used by Middle Eastern states which can be seen as ambiguous due to its temporary category. My paper was called ‘From Local to Global: Middle Eastern Churches and Migration – The UK Case Study’ and explored some of the themes which have come up in the early stages of the UK fieldwork. Using the case studies of the Coptic Orthodox and Syriac Orthodox denominations, I explored how the churches attempt to provide community needs, community responses to these attempts and challenges faced in church efforts to deal with the situation of now being global churches with adherents outside of the traditional Middle East region. In particular, I emphasised the notion of unity under the patriarch, the significance of having their own church building and the complexities of meeting the needs of both first and second generation members of the congregation. The paper appeared well-received with comments that the importance of having own space and its link to a sense of belonging is similar in many faith-based migrant communities. One of the most useful presentations for the DIMECCE project was Dr Bernardo Brown’s (Leiden University, Netherlands) anthropological study of Sri Lankan migrant workers in Italy and the experiences of the Sri Lankan Catholic chaplaincy in catering to their needs. In his paper entitled ‘The Pitfalls of a Multicultural Church: Notes on Sri Lankan Transnational Workers and the Migrant Chaplaincy in London’, Dr Brown identified similar themes such as the debate among clergy regarding engagement with Italian culture and society, fears about the impact of integration and/or assimilation on maintaining Sri Lankan culture, discussion about homeland events including a growing human rights discourse, language issues regarding the second generation and some tensions regarding sharing places of worship with Italian Catholic communities. This fascinating presentation also left me thinking that the DIMECCE team should further explore literature on Catholic migrant churches in Europe in order to learn what themes have been addressed and to exchange ideas in the future. This conference highlighted the benefits of interdisciplinary scholarly exchange with several keynote discussions from theologians and migration scholars. However, one of the highlights for me was the film screening of the documentary ‘Everyday Heroes’ which tells the story of a group of Mexican women known as ‘Las Patronas’ who provide assistance to migrants from Central America travelling through Mexico – primarily on the roofs of trains – hoping to gain entrance to the United States. This moving film reinforces a message that is often lost in the debate on migration but one which bringing faith back in should perhaps assist in highlighting, that is that migrants are first and foremost human beings. We were privileged to have Norma Romero, a member of ‘Las Patronas’ who were winners of Mexico’s 2013 National Human Rights Award, to answer our questions about the documentary and the work of the group. I would encourage you to watch this film if you ever have the opportunity. Overall, this was an interesting conference although as is often the case, perhaps the attendees were those who already wish to bring faith back in to the migration discussion and the challenge now is to have a wider impact upon the academic and policymaking community. In terms of DIMECCE UK, it was a successful outing for our first conference paper and we look forward to many more in as pleasant and interest settings as Oxford. On early Friday afternoon our Danish hosts – Lise and Sara – warmly welcomed the rest of the DIMECCE team (Fiona, Alistair, Danielle and me) in the heart of Copenhagen and took us for a walk to discover the superdiversity of Nørrebro, one of the most multicultural areas of the Danish capital. We noticed instantly a certain number of signs in Arabic and Turkish advertising restaurants, goldsmiths, hairdressers, financial services, and sales of jellabiyas. Several Muslim ladies wearing different hijabs passed us by, some of them on their bicycles, which is the Danes’ favourite way to commute. As it was just after the Friday noon prayers we could see men leaving the modest building used as a mosque – Masjid Al-Nour (Mosque of Light). The whole area seemed to be popular with people from diverse backgrounds, who sat in front of cosy restaurants. Lise told us that lots of effort was made to transform what was once not the safest neighbourhood into a place bustling with life. Since there are not as many Middle Eastern Christians in Denmark as in the UK or Sweden, Lise and Sara organised a visit to the Islamic Christian Study Center (Islamisk-Kristent Studiecenter, IKS), founded in 1996 by both Christians and Muslims to facilitate and encourage interfaith dialogue. We had a very interesting meeting at the IKS offices with Rev. Lissi Rasmussen. She told us that this unique organisation has evolved ‘from talking to doing things together’. The dialogue group is still active, analysing and discussing the sacred texts, but these days the social work comes first: volunteers help people in need, often of Middle Eastern origin, in hospitals and prisons. On Saturday afternoon, we had a thought-provoking conversation with a young woman belonging to the Chaldean Catholic Church in Denmark. Thanks to the presence of Nora (Danish team research assistant), who is of Lebanese origin, and Danielle (Swedish team research assistant), who is of Syrian origin, we had an exceptional opportunity to discover some similarities and differences in outlook among young Christians from the Middle East of different national origins. While the Church traditions differ, the aspiration of high educational achievement and personal development is very similar – young Christian women whose parents come from the Middle East often make the best of the possibilities European countries can offer. On Sunday Lise and Sara drove us to Taastrup – 20 km outside Copenhagen – where St. Maria & St. Markus Coptic Orthodox Church is located. The white building (see photo below) used to serve a Roman Catholic congregation but its present interior furnishings (e.g. wooden altar screen, icons, holy relics of St George and Abu Sufyan) were all brought from Egypt. We came punctually at 9 am being the first there aside from the priest but soon the church started to fill up. We were asked to remove our shoes which is a Coptic tradition based on Exodus 3:5 (God said to Moses to remove his sandals from his feet, for the place where he is standing is holy ground). Interestingly, some people used plastic covers for their shoes. The mass, which was performed in Arabic with some Coptic and English (the latter being to include the youth who do not understand Arabic very well), lasted about 3 hours. In addition, Danish translations of the liturgy were projected on screens above the pews and occasionally via headphones. The people attending came from different places in Denmark – and some had even crossed over the Øresund Bridge from southern Sweden. We were also intrigued to find that others had close ties with the Coptic Orthodox Church in the Scottish fieldsite of Kirkcaldy. Not all were Copts – some participants belonged to the Syriac Orthodox Church and/or had an Iraqi background. After the mass, a tasty lunch was served in a nearby hall; it was a celebratory occasion as two young children had birthdays and an adult member of the congregation had just acquired Danish citizenship. We mingled with the church members and enjoyed the relaxed atmosphere – certainly, it was a close knit community. We spent our two last days in Denmark at the charming seaside resort of Helenekilde. Aside from having our project meeting there, our schedule included an interview with Doris Peschke from our partner institution, the Churches’ Commission for Migrants in Europe (CCME), who added a precious practical perspective to our theoretical one. We also had the pleasure of listening to an informative presentation by one of our Advisory Board members, Professor Margit Warburg (University of Copenhagen) about the Danish model for recognizing faith communities. Among other things, we learned that although 79% of the Danish population belongs to the Danish Lutheran Church, the proportion of Danes who self-identify as religious is rather lower. To understand better the situation of Middle Eastern Christians in Denmark, one must remember that they constitute a minority within a minority. Far more numerous are the migrant workers (and their families) who arrived from Turkey, Pakistan and Morocco in the 1970s, followed by refugees from Iran, Iraq, Somalia and Bosnia in the 1980s and 1990s. This numerical weight has led to recognition, including from the national Lutheran Church. In comparison to the situation in the UK or Sweden, Middle Eastern Christians in Denmark have far fewer activities, primarily due to the smaller size of the congregations. Despite this – or even because of this – their internal dynamics are worth exploring. We are very grateful to Lise and Sara for introducing us to these communities! Our British colleagues, Fiona and Alistair, had put together an excellent programme which included several church services, a Coptic youth meeting, a children’s party organised by the UK Assyrian Society, and a walking tour in the ‘super-diverse’ borough of Ealing, including stops in Southall and Hanwell. These activities were only a selection of the many religious, cultural and social places and events catering to Christians of Middle Eastern origin. With a population of around 8 million and a long history of immigration from, among other places, the Middle East and North Africa (MENA), London presents a wide range of Middle Eastern Christian congregations and organisations which is one of the most diverse outside the MENA region. Coming from the Danish context where the largest among these denominations numbers a few thousands nationwide, it was striking how, for example, some of the churches we attended could gather a congregation of several hundred for a single service. Below, I will briefly touch upon some of the potential analytical implications when comparing the situation of these communities in London with that of their equivalents in a small country like Denmark. But first, let me highlight some of our field experiences. On Palm Sunday we had to make the difficult choice of which services to attend. The possibilities were many, almost overwhelming, and we decided to split the group in two. While Alistair and Marta attended the service of the Ancient Church of the East in Hanwell in the morning, followed by the Syriac Orthodox Church in Acton in the afternoon, Fiona, Lise and I decided to go for the Holy Liturgy service in St Mark’s Coptic Orthodox Church in the morning after which we visited the Living Water Arabic Church. In both churches the priests were of Egyptian origin, but when it came to liturgy and ritual practice, they could not have been more different. Established in 1975, St Mark’s is the oldest Coptic Orthodox church in the United Kingdom and indeed is believed to be the oldest Coptic Orthodox church in Europe. The church is located in a quiet street in the affluent neighbourhood of Kensington. We arrived at the church just before 9:30 am in time for the liturgy service, but due to the Palm Sunday procession which was just finishing, the church was already packed. A quick count revealed that at least 600 people were gathered in the church. According to Fiona, this was more than on ‘usual’ Sundays. We found our way through the crowded entrance area and were lucky to find three empty plastic chairs at the back behind the pews in the right side of the church together with the other women. A middle-aged woman seated just in front of us gave us the palm crosses that everyone seemed to have. The service was held by four priests with the help of around twenty-five deacons, all of whom were dressed in white robes. All the priests wore white mitres on their heads. The priests switched between English, Arabic and Coptic, although Coptic was dominant especially for the parts requiring congregation participation. Compared to the Lutheran evangelical service that I know, there was a lot more standing and congregational responses. And every time we stood up, our chairs were pushed towards the back of our legs as people continued to enter the church room and the areas around the pews got more and more crowded. On our way out, we noticed that the vestibule of the church was full of people. Another obvious difference with the service that I know was the intense use of incense which filled the church from floor to roof and sometimes along the way made my eyes water and my throat feel dry. Four large TV screens at each side of the room displayed the words of the chants and prayers in English, Arabic and Coptic. Towards the end of the service, one of the priests held a short sermon on the theme of Jesus the King entering one’s life. The singing lasted around fifty minutes, whereupon the band leader took the microphone with him from the keyboard and moved closer to the congregation. The rest of the orchestra left the altar. I now realized that the band leader was in fact the pastor. He started speaking to the congregation, and after a short bible reading, he gave a long sermon on the same theme as in the Coptic Orthodox Church of letting Jesus be the king of your life. Comparing the morning service in St Mark’s Church, attendance of the Living Water Arabic Church was a completely different experience – in sensory, social and liturgical terms. First of all, the pastor wore no religious vestments, and apart from the bible and the palm crosses no religious items were used during the sermon. This was in stark contrast to the Coptic Orthodox service where anyone with a religious function had at least one special vestment, and where the priests and their deacons made frequent use of, among other things, crosses, icons and incense. Secondly, unlike in the Coptic Orthodox Church, men and women in the congregation sat beside each other. Thirdly, whereas the theme was the same, the two sermons differed in terms of length and style. In St. Mark’s, the sermon lasted only about five minutes, while in the Living Water Church it went on for more than an hour. Finally, unlike the orthodox priests, the pastor of Living Water church deliberately spoke more directly to the congregation, rarely stayed in the altar area, asked rhetorical questions, and invited people to put their hand up if they believed in certain things. Thus, although the theme of the two sermons was the same, the language and preaching style was very different. The Living Water service ended by singing one of the previous songs while almost everyone marched around the church waving their palm crosses. In London, all Middle Eastern Christian denominations are represented, which means that everyone in principle has the choice of attending his or her own church. Unlike in the Danish context, all churches have weekly services and a resident priest. Furthermore, due to the size of many of the congregations, it is possible for most of these churches to offer various kinds of activities, for example catering to different age groups within the congregation. In St Mark’s Coptic Orthodox Church, for example, there is a large youth group which runs its own activities. Also outside the churches, there are possibilities in London to meet people of similar ethnic and/or religious background. The Assyrian House in Ealing, a large meeting hall which belongs to the Assyrian Society of the United Kingdom, is one such example. Another significant characteristic is the role of the language. It was my impression that English is more commonly used as part of the liturgy than in most Middle Eastern churches in Denmark. In the Coptic Orthodox Church we attended, English was an integrated part, and when either Arabic or Coptic was used, a translation was provided on the TV screen. The service at Living Water Church was in Arabic, except for a few songs in English, but an English simultaneous interpretation was provided for non-Arabic speakers. A relevant perspective to pursue is therefore what it means for the linguistic practices of the churches that the language of the country of residence is a world language like English or small languages like Danish or Swedish. Furthermore, it would be interesting to compare the mechanisms of inclusion and exclusion of e.g. particular age groups and generations in the three countries as a result of particular linguistic practices. As a fieldtrip, our stay in London was extremely relevant and fruitful. By visiting neighbourhoods, churches and a cultural association, we got a small but telling glimpse of the reality of Middle Eastern Christians in London. This raised new questions and ideas about our ‘own’ fieldwork contexts, in particular the importance of the size these communities, their access to priests and church facilities, and the role of language. But it also provided us with a better understanding of the UK as one of the transnational centres of Middle Eastern Christians.